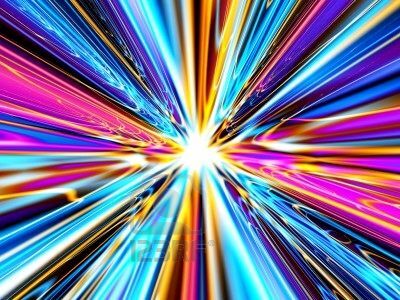 When you are totally in the zone, you can manifest at the speed of light. Here’s a true story that shows just how quickly it can happen. Already laughing in amazement at that incredible coincidence, we went out to catch a cab to our next destination. At one point, the cab stopped at a red light and standing on the pavement by our window was sat the person I’d mentioned wanting to meet less than an hour earlier! My friend opened the window I met her then and there! You know what it’s like when you feel like an unstoppable force, when you power through obstacles before they’ve even had time to take shape and when absolutely nothing that happens slows you down for a second.The fact is that you can create at the speed of light – but we don’t always want to. We can be slowed down by all sorts of things that I talk a lot about here – by our beliefs and ideas about what’s possible in general or for us in particular, but it can come as a real surprise to know that we can be just as much slowed down by not wanting to get too far away from happiness we have known in the past! This might come as just a bit of a shock, but here’s how it works. As I’ve explained, to be at your most powerful, you have to be totally in alignment with your intention and attention going full steam ahead. Having our psychic energy perpetually hauled back to deal with unfinished business or buried pain is something that we’re all familiar with. In fact, an entire culture of therapy is built on that idea. But you can be just as distracted and get pulled away from now, your future and what you want to go on and create by being totally happy in the past! I’m sure you’ve all known people who seem to have got stuck in a time warp. A friend of mine was very struck by a teacher she had at school who never veered from a look that she had clearly arrived at in the sixties and had stopped right there. It was obvious that the way she did her hair and makeup and the clothes she wore had made her feel beautiful at the time she first chose them, and she probably associated a lot of very happy memories with the whole package that she fondly relived every time she recreated it on a daily basis. No problem with that, apart from it was twenty years on! The way she looked was a direct physical manifestation of what we can all do – keep going back to when we felt good or had brilliant times instead of putting our intention or attention on what we are creating in the present and for our future. This is why so many people’s lives seem to tail off after a certain age – especially the age at which our culture can tells us that it’s all over and we have nothing to do but sit and look back over what we’ve achieved rather than setting ourselves new goals and dreams. Enjoy all of your good memories by all means, but when you are working with manifestation, know that now is your point of power and trust that the best is yet to come! Check that you are moving full steam ahead. 1/Stalk your thoughts and speech to find out how much time you spend thinking and talking about the past and how much you spend thinking and talking about now and the future. In particular, be alert for energy shifts. Do you light up when you recall taking the lead in the school play when you were 15 and deflate when you think about what’s in your life right now? 2/Sit down and make a list of all of the changes that you’ve made or that have happened in the past five years – everything from moving house, changing jobs, learning new skills or making new friends. The more you can put on that list, the more you have trained yourself to orient towards the present and future. If it’s totally blank because not one single thing has changed or been added to your life in the past five years, it’s little wonder if you feel a bit stagnant! 3/Be honest about whether you believe that you’ve already had the best of life, or whether you think the best is yet to come. 4/Do you have a raft of goals, dreams and desires that relate to your future? It doesn’t all have to be about travelling around the world or giving up working as a dental assistant to train as a chiropractor. It can be as small as a novel you’re looking forward to reading, a film you really want to see or a nearby place you really want to go and visit. Make sure your present and future is crammed with goodies of all shapes and sizes that you can’t wait to get to. My english is not so good. But Please guide me step by step how i can menifest at the speed of light. I really need help to menifest my desire.